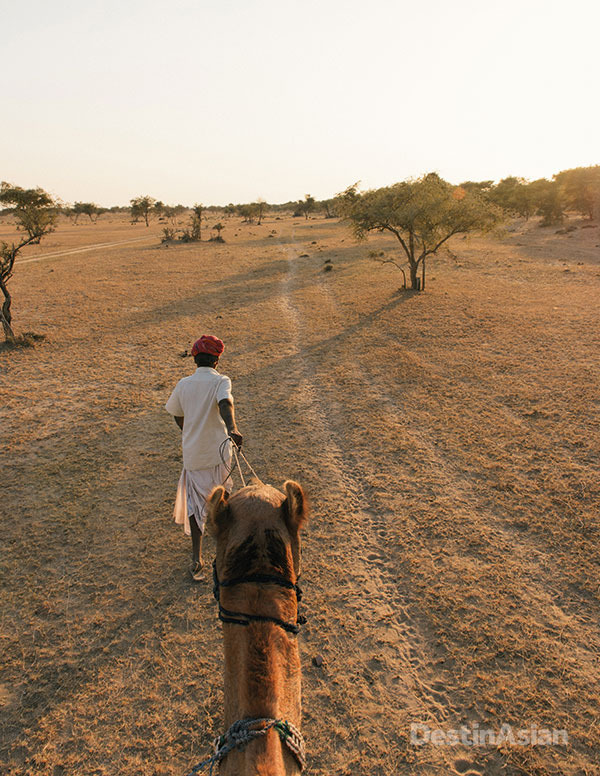 A guide leads the way on a camel trek through the desert surrounding The Serai. The main pool and dining tent at The Serai. 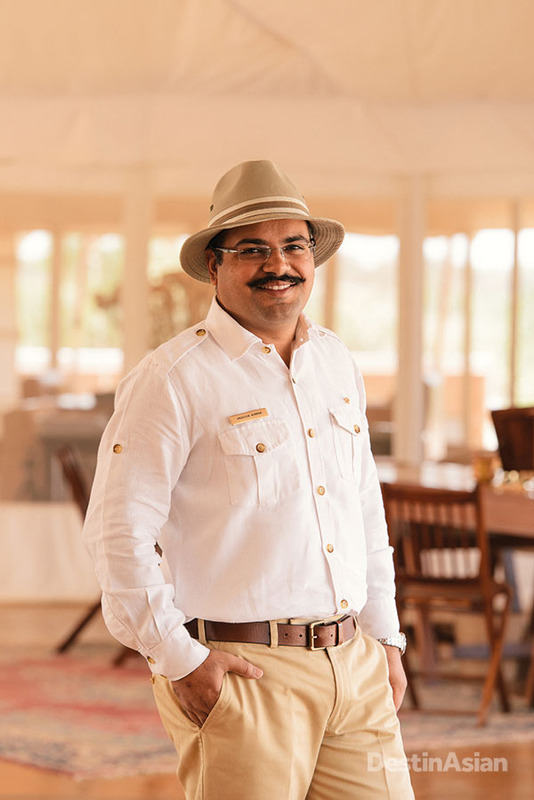 Prateek Kumar, the camp's general manager. 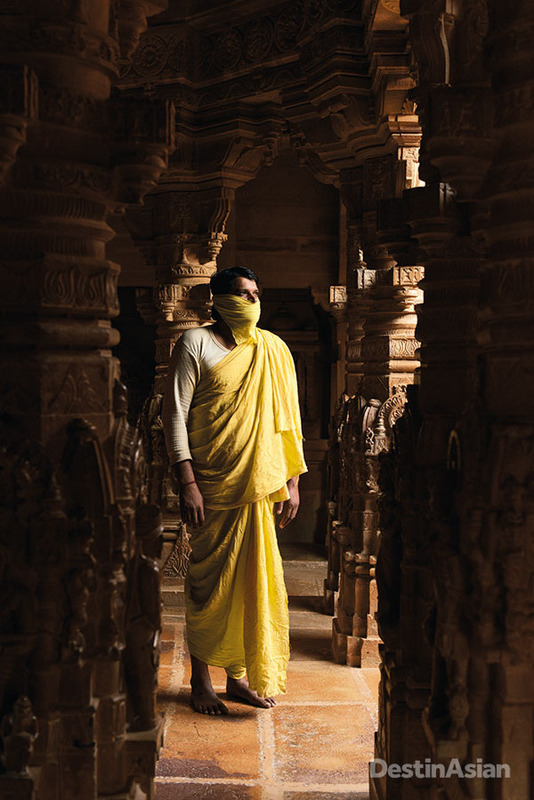 A Jain monk of the Shvetambara sect in the sanctum of Jaisalmer Fort's Parshvanath Temple. Shvetambara ascetics wear muslin cloths (muhapatti) over their mouths to avoid inadvertently killing insects by inhaling them. 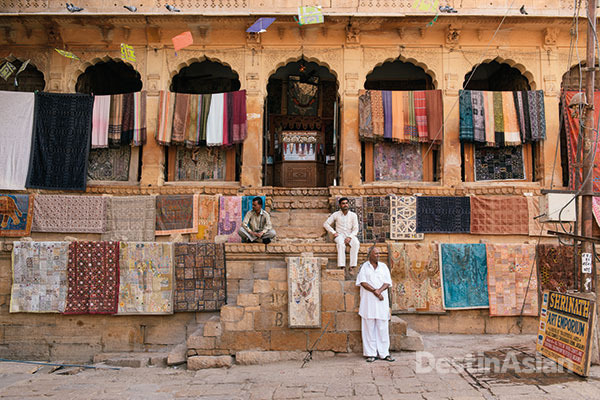 Carpets for sale in the market square of Dussehra Chowk. Comin rice, paneer mutter masala, and butter naan at the restaurant in the ramparts of Jaisalmer Fort. 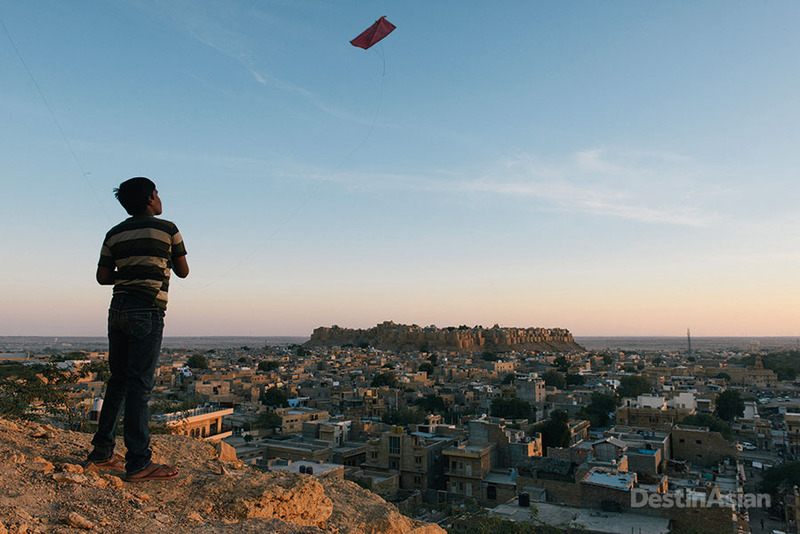 A hill outside town provides the perfect perch for a young kite flier - not to mention a stunning view over Jaisalmer and its centerpiece fort. 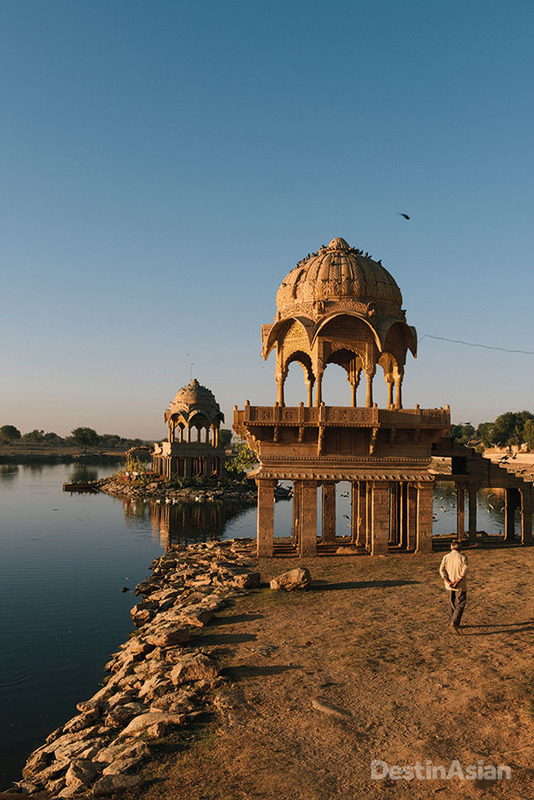 A morning stroll among the cenotaphs of Gadi Sagar, an artificial lake to the south of town. 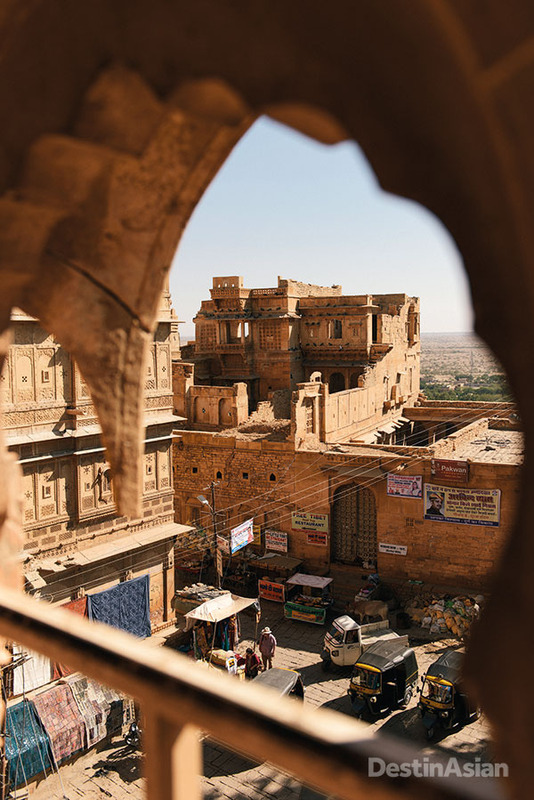 Looking down on Dussehra Chowk from the Forst Palace Museum and Heritage Centre, a onetime royal residence that now serves as a showcase for Jaisalmer's rich history. Dr. Bhang at the entrance to his specialty lassi shop. Immediately after entering the gate I’m plunged into a maze of chaotic residential streets. Motorcycles zoom down twisted lanes, cows lumber through narrow alleys, laundry flaps from ancient balustrades, and at every step, someone tries to sell me something. Tiny souvenir shops vend silk scarves and books bound in camel leather, while incongruous signboards offer everything from “Viagra Bed Sheets” to “CD Burning.” Many houses have wedding invitations painted on their front walls, bright murals depicting Ganesha. Presumably in a place where everyone knows each other, there’s no need for personal invites. 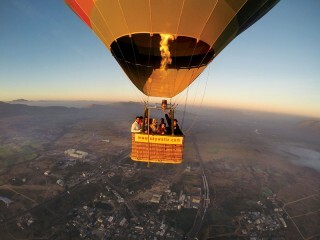 The most beautiful part of the fort is the cluster of seven sandstone Jain temples standing at its center. Built between the 12th and 15th centuries and dedicated to various tirthankars, or Jain saints, the temples are masterworks of soaring spires, scalloped arches, cornices, and delicately chiseled filigree. The ceiling of one is sculpted with a demonic head encircled by four bodies, which represent the different states of existence that one can be reincarnated as after death: angels, demons, humans, and animals. In the basement of another is the Gyan Bhandar Library, a tiny, dim-lit repository filled with palm-leaf manuscripts, astrological charts, and religious imagery detailed with precious stones and ivory. Eying everything carefully, I spot a giraffe motif on one of the documents, a reminder that Jaisalmer’s old trade links once stretched as far as Egypt. In my search for the unusual, I land upon a tiny bhang shop run by a man named Chander Prakash Vyas, known to his customers as Dr. Bhang. 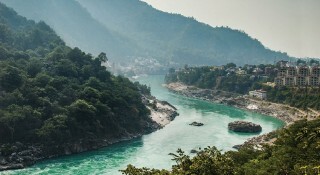 Bhang is a paste made from cannabis, and its use is said to have started in holy cities where Brahmins were not allowed to consume alcohol or smoke. 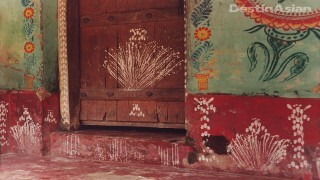 Bhang provided an alternate source of stimulation; Dr. Bhang tells me it’s blessed by Shiva. 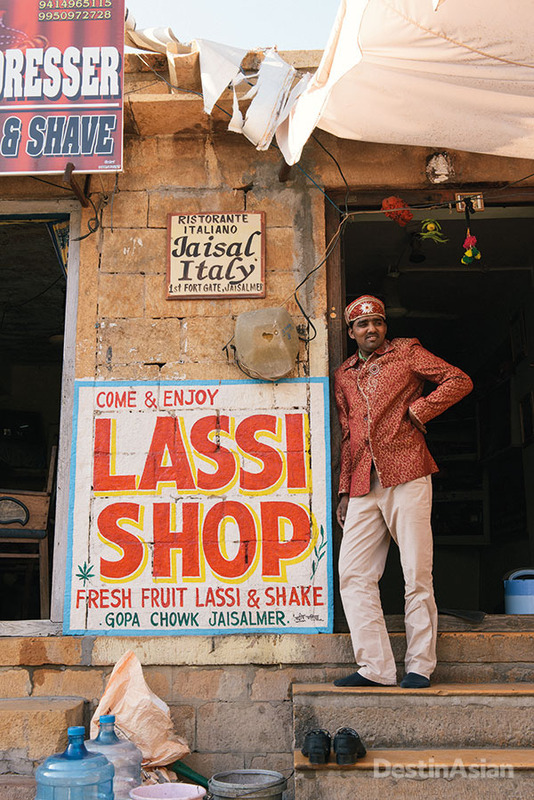 His specialty is bhang lassi, but he also sells bhang-laced chocolates, cookies, sweets, and buttermilk. I try the lassi. Made with pistachios, saffron, and black pepper, it’s thick and green and tastes like gritty soymilk. And though I don’t start to hallucinate, I do leave with a few more giggles than usual. The main attraction on the square is the entrance to the city’s Rajmahal, the former royal residence. It’s now the Jaisalmer Fort Palace Museum & Heritage Centre, but on its sides are handprints, reminders of what once took place here. In the 14th and 15th centuries, royal widows committing sati—self-immolation—would dip their hands in henna and press them against the palace walls before jumping into their husband’s funeral pyre. Climbing up to one of the cannon emplacements that ring the fort’s ramparts, where these women might have once stood, I’m met with quite a different scene. 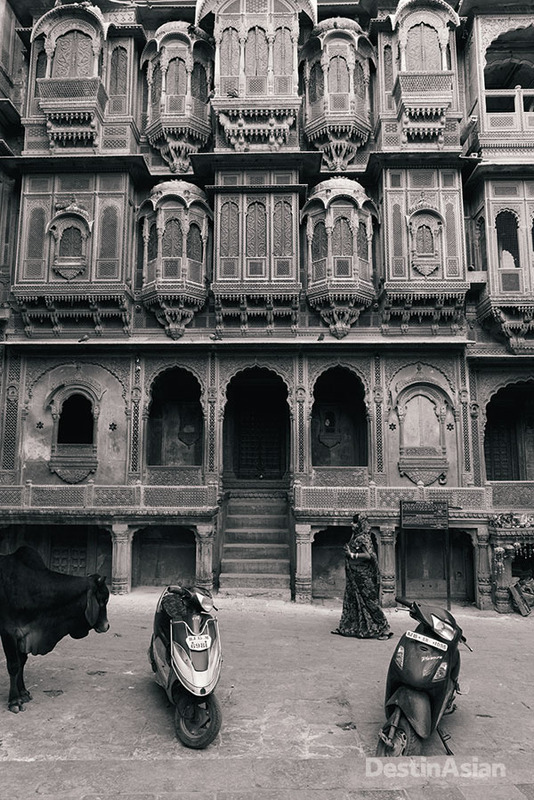 All of Jaisalmer is below my feet with its flat-roofed houses, kites floating in the sky above, and the vast Thar Desert spread beyond, drenched in blinding sunlight. It’s this desert that many of Jaisalmer’s visitors come to explore, which I venture to do on a camel safari and night spent out on the sand. After riding about 45 minutes in a truck, my group arrives at a clearing where a dozen camels await, batting their long eyelashes and grazing on stubby desert cotton trees and spiny khejri trees. We hoist ourselves up atop the backs of the animals—mine is named Lala—and leave the road, entering a sparse landscape with squat trees, cacti, and the occasional dune, trotting through small villages along the way where groups of locals walk alongside us, herding goats and sheep. As the sun dips below the horizon, I become mesmerized by the stunning patterns of swirling, rippling sand. Then I catch a glimpse of a lithe desert fox, who trains his tawny eyes on us before scurrying out of sight. All the rolling and lurching in the saddle makes my back ache, and I’m relieved when, by late evening, we stop at a dune to set up camp. 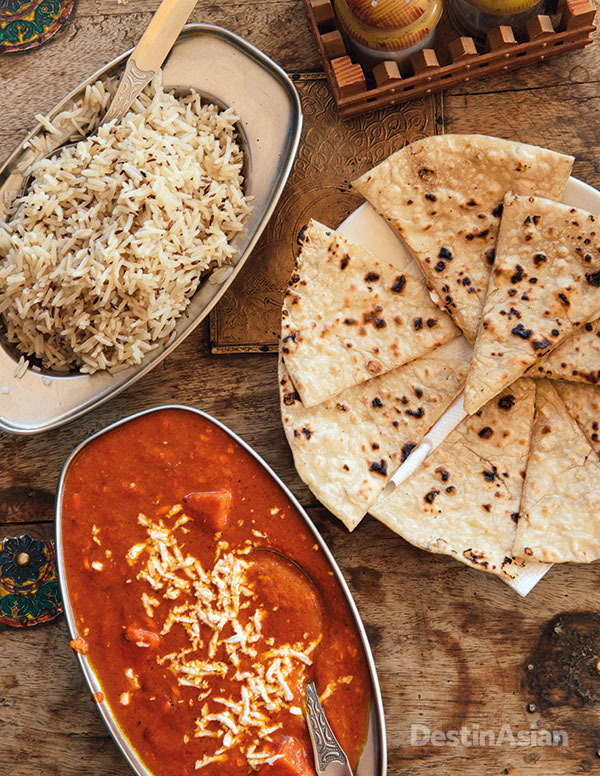 We dine on simple fare of curried vegetables, chapattis, and rice cooked over a wood fire. It isn’t fine dining, but eaten under a starry desert sky to the accompaniment of whistling wind and snorting camels, it tastes better than anything I’ve eaten all trip. In the morning, I wake to the sound of wild peacocks rustling through the distant bushes as the first rays of the sun warm the sand. The local diet is predominantly vegetarian and shaped by the scarcity of water. “To decrease the use of water, a lot of milk products are used to cook food instead, such as clarified butter and buttermilk,” explains the chef back at The Serai. Many of the staple foods were also discovered by Rajasthani villagers in times of famine when they had to survive off of anything they could find, such as ker, a type of bean, and sangri, a thorny tree whose leaflets become edible after being soaked or boiled. 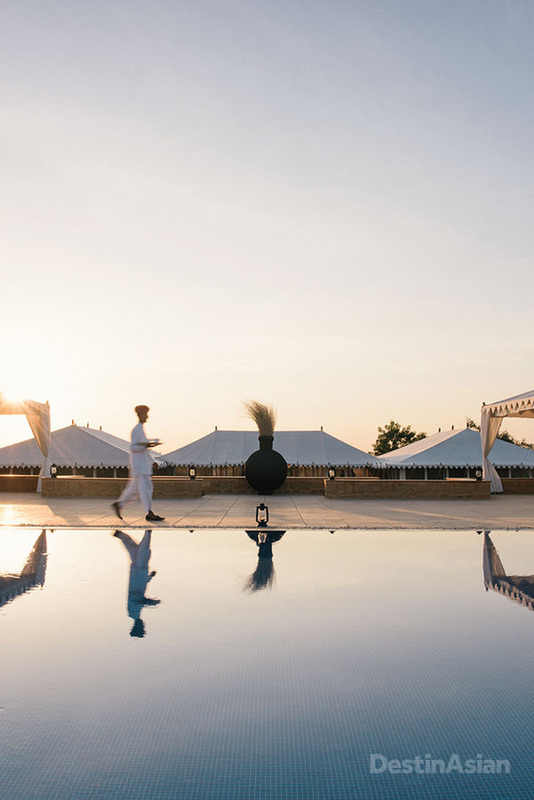 At The Serai, they’re prepared as part of a five-part Rajasthani thali of piquant desert legumes cooked in creamy yogurt, served with the signature dish of the region, dhal bhati churma—lentil curry and baked wheat balls dipped in ghee and crushed churma. Washed down with a creamy lassi, it’s an unforgettable—albeit calorific—feast. 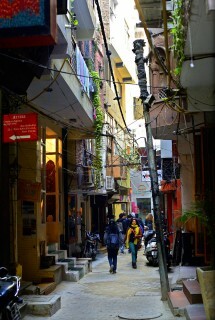 Old meets new—and so much more—in the vibrant Delhi neighborhood of Hauz Khas Village. In the South Delhi neighborhood of Hauz Khas Village, check out the artisanal wares at Nappa Dori. 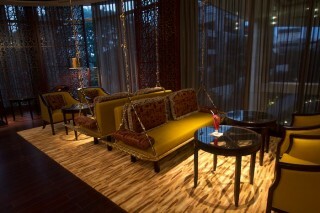 The Ritz-Carlton's first property in India lands in the Subcontinent’s tech capital of Bangalore.